GalleryMasterTM : A complete, integrated security system to minimise risk of theft and environmental damage to valuable works of art and artefacts on display or in store. Designed for medium to large museums, galleries and palaces where it is desired to have a manned or part manned security control room or reception area. GalleryMaster can enhance object protection and invigilator productivity during display hours as well as providing an extra layer of security at night. The system utilises a variety of sensor technologies (indoor range upto 75m and upto 6,400 rfid wire free sensors). The sensors should be selected for the appropriate technology/performance to protect a specific item e.g. paining, vase, sculpture, display case or fabric. Battery lifetimes can be up to 5 years. The sensors send out OK and security, temperature and humidity alarm signals wire free and encrypted for added security. Each sensor has an unique ID (rfid). Signals picked up by wire free repeaters and / or hardwired receiver units. NOW: Environmental monitoring capability (temperature and humidity), you can specify which sensors alert visitor services and which alarms alert the curators. The GalleryMasterTM system utilizes receivers and repeaters normally spaced every 75 to 100m through the museum. Receivers are simply wired in a long line (the cable carries the power as well as the communications) back to the PC. Repeaters are separately powered (7 - 24vdc) and allow wire free communication in areas which are difficult to cable. The Interface (Control) box is normally be located in the security control room or on the reception desk. The software runs on a PC or network (windows platform) and allows the security manager (password controlled) to designate a name and location to each sensor. On alarm this information immediately appears on the PC screen. 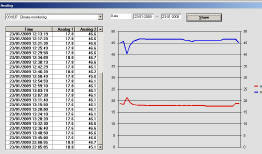 Also communicated are sensor signal faults (low battery), jamming and sensor and receiver signal strength. In addition output relays can be added (max 640) and can be configured to correspond to a sensor, location or group of sensors. These have been used to link to sounders or CCTV cameras. In addition communication is available using a (RS232) serial interface to pagers and CCTV and there is also a GSM modem option for SMS and emails. It is good practice to investigate each alarm and the system can be reset once the control room enter in a comment. Security manager programmes in the desired response to close relay outputs, send pager and CCTV instructions. Security level password controlled, warnings against jamming, cable cutting and weak/no signal. no. max. 32 (can be increased). 8 output relays / unit (std) with NO and NC options. To pass on alarm and OK signals from many sensors. Contains 1 output relay. 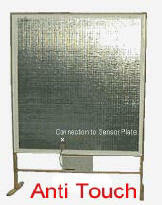 The most popular (and least expensive) detector is triggered either by vibration or magnet. The tag just measures 79mm x 39mm x 9mm. It is battery driven (lifetime upto five years). It is easy to install. It can be placed behind the frame of a painting, in or under a vase, in a display case or somewhere it would be hidden from sight. If the exhibit is touched or moved, the detector will send a wireless signal to the Receiver. The sensitivity is individually adjustable for each sensor so you may desire that 2 signals will result in an alarm response for example. The system is extremely flexible, the sensors can be renamed or switched on and off individually. ShockSensor has adjustable sensitivity, option available that can be triggered by a magnet. 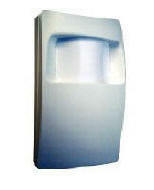 The UltraSound Sensor is for enclosed spaces like display cases and small rooms. 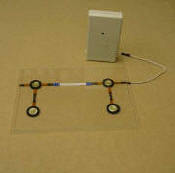 The Non Contact (InfraRed) Sensor does not need to make contact with the exhibit to be effective. The Environmental Sensor measures both temperature and humidity (NPL traceable) (sensor to left of red arrow). Other sensors include Flood Early Warning, InfraRed Beam (Internal and External), BarrierPIR, Temperature and humidity probes. Range (inside) between detector and alarm receiver: Shock & InfraRed 50m. Euronova would be happy to quote for installation but we have found most museums prefer to use their regular alarm or electrical installer. We then ensure the installer is well trained and provide telephone (or physical) help and assistance. The main job is the cabling installation and the connection to the mains power supply or UPS. This is often done by the security manager, curators or assistant and will take some time on a big site. Euronova provide this. We give one to one training to the different user levels and 7 day a week telephone support. If a long line is needed then a cable with less resistance per 1km is required. This can be done with twisted pair (4*2 cable which is standard networking cable using 3 of the 4 pairs to provide power along the line; effective resistance is 33 ohm/km). Utilisation of an existing computer (LAN) network is possible. Either for remote monitoring and control (at a different PC) or to connect a line of receivers to the PC via PC Interface. IP connections are possible. Contact Euronova for more details. Pagers/communicators: via the second serial or a converted USB port this can be linked to a Serial Interface which will then communicate alarm messages to appropriate guards. Different "zones" can be created to control the messaging. Relay Interfaces: Clean contact relays NO/NC can be purchased in blocks of 8 and these can be controlled from the software to give excellent links to CCTV or Access Control systems. GalleryMaster is now available with "Viewer" software to view the alarm status and history from any PC on the network. CCTV camera presets are controlled using either relays (contacts) or the RS232 output. 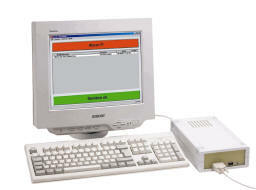 GSM module: The GalleryMaster system is often supplemented with a GSM modem. When an alarm is received, the alarm is send via SMS messages, for example, to a mobile phone. The GSM unit is installed in the factory when ordered. To insert a SIM card, press the minute yellow button and a small tray pops out. Check that the GSM modem has connection to the network via the GalleryMaster software. Pricing: Systems are completely variable but a "starting price" for GalleryMaster would be approx GBP 8,000 + VAT and delivery. The system has a 1 year warranty. UPS (Uninterrupted Power Supply): GalleryMaster can be connected to an UPS power controller. With an UPS power controller the system will function a number of minutes after a power failure. Also a maximum of 32 relay boxes plus receivers can be used from the PC Interface supply. (If more is needed then a secondary power supply can be used).